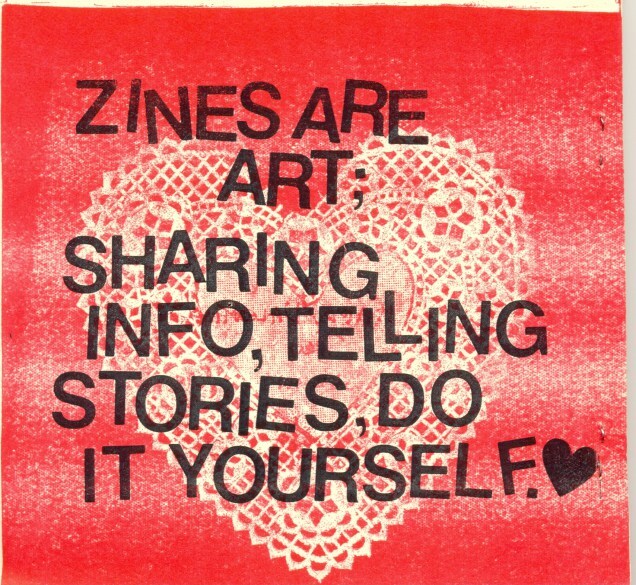 The Barnard Zine Library – collects zines on feminism and femme identity by people of all genders. Femme Crimes Distro – Etsy store that sells feminist and queer zines. Girls Don’t Zine – a non-profit zine making fun of societies expectations of women. Girls Get Busy Zine – a feminist creative platform that supports artists, writers and musicians. Hoax – a US bi-annual queer feminist compilation zine that aims to create a space to analyze the feminisms of our everyday lives. Mend My Dress Press – a small publisher and distributor based out of Tacoma, Washington who are purveyors of anthologies of zines, small art books, investigative social pieces, and local authors. Muchacha – a quarterly fanzine that seeks to promote the “F” word feminism, encourage involvement in DIY music/art communities & inspire participation in grassroots activism. One of My Kind (OOMK) – a highly visual, handcrafted small-press publication. The content largely pivots upon the imaginations, creativity and spirituality of women. POC Zine Project – mission is to make all zines by people of color easy to find, distribute and share. Toronto Queer Zine Fair – seeks to make space for traditionally marginalized voices in the zine community.